FISHERMAN PERFECTS MEASURER THAT EVEN THE FISH WILL LOVE! Easy in and easy out with less stress for you and the fish. 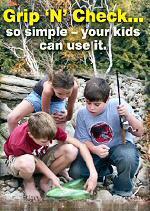 Less handling means less slime loss and no more dropping a flopping fish as you try to measure it. 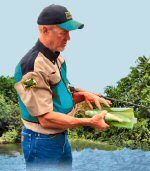 The patented Grip 'N' Check™ design stops the flop and reduces risk of injury to the fish and the fisherman. With either hand, merely grip the fish by the lip and slide it into the funnel arms down to the thumb press - then let go as the fish is guided into measuring position. Then, use the thumb press to stop the flopping while you read the measurement. Flattened nose surface ensures more precise measurement. Raised grip lines prevent slippage and increase control. Curved thumb press stops flop and protects fish. Right- or left-handed thumb guides give you room to position fish. Funnel arms won't let fish flop out even if you let go early. Highlighted EASY-READ BOX marks legal 9- to 10-inch measure. Wide entry allows easy, quick guide into measurer. Nose shield prevents fish's nose from curling. 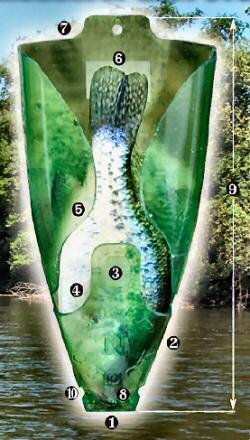 Extra-long design lets you measure up to 13-inch fish. Returning a fish to the lake? simply turn Grip 'N' Check on end, entry side toward the water. 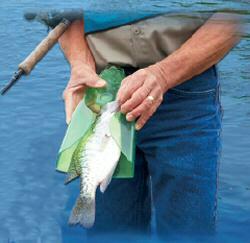 The handy grip surface on both sides helps prevent tossing your measurer into the lake with the fish.